I’m sure many of you have seen that two new “Diet” pills were recently approved by the FDA. Once I saw this, I braced myself for the inevitable flood of people coming to my office asking to be prescribed the latest quick fix; and as expected, I was not disappointed. I’ve had at least 10 people over the last month ask for one of the new pills, and I thought this would be a great topic to discuss in this setting. I’ve mentioned in prior posts that in my 15 years of training and private practice I have prescribed diet pills a grand total of ZERO times. So, will these new medicines change my habits? Lets look and see what we got. -The safety and effectiveness of Qsymia in combination with other products intended for weight loss…has not been established. -Qsymia can harm your unborn baby. -Qsymia can increase your heart rate at rest. -Qsymia increases the risk of suicidal thoughts or behavior. -The most common side effects seen in Qsymia clinical studies were tingling in the hands and feet, dizziness, change in taste, trouble sleeping, constipation, and dry mouth. Because Qsymia contains phentermine (a pharmacologic cousin to amphetamine) it is classified as a federally controlled substance, indicating it can be abused or lead to drug dependence. It’s basic mechanism of action is to reduce hunger and increase the release of serotonin and dopamine in the brain. It’s important to note that topiramate, also known commercially as Topamax is a seizure and migraine medicine that just so happens to make people feel full. Most common adverse reactions (greater than 5%) in non-diabetic patients are headache, dizziness, fatigue, nausea, dry mouth, and constipation, and in diabetic patients are hypoglycemia, headache, back pain, cough, and fatigue. Belviq’s mechanism of action is that it stimulates brain receptors for serotonin, a neurotransmitter that initiates feelings of fullness. Basically, both of these drugs try to trick your brain into thinking that you are full. So, will I prescribe any of these medicines for my patients? Well you guessed it, the answer is no! The reason is simple, SAFETY. We may all remember Fen Phen, a diet pill from some years back that was taken off the market due to causing serious valvular heart disease resulting in congestive heart failure. I remember vividly being called to the ER soon after I moved back to Louisiana to admit a young lady with heart failure. I remember thinking it odd that a 32 year old female would be in severe heart failure, but the mystery was revealed once I got to the ER and spoke to her. Turns out she had taken Fen Phen for TWO WEEKS in an effort to lose a few pounds and fit in a dress for a friend’s wedding. She developed severe Mitral Valvular Heart Disease and resultant heart failure. She had a valve replacement, but it never worked well and she had severe chronic congestive heart failure as a result. The look on her face telling me the story said it all…”I was an idiot, looked for a quick fix, and look at me now.” I really felt bad for her. A year ago both of these drugs came up for FDA approval and they were denied…why? They were not felt to be safe from the cardiovascular standpoint, and both seemed to have significant teratogenic effects. It is simply not known if these drugs can potentially cause the same valvular heart disease that Fen Phen caused. Now look, I’m not at all saying they will, but information from the MANUFACTURERS themselves clearly state that the risks are unknown. Also not, the Phen is Fen Phen…yep, it’s short for phentermine. The FDA stated that the medicines were given approval essentially because doctors needed “something” to combat the worsening obesity epidemic. I see it as a basic act of desperation from the FDA, and truthfully I understand their viewpoint on this. Do I agree with it? No, but I understand where they are coming from. Regardless, this physician won’t be writing out scripts for these meds any time soon. -If these pills worked, would there be ONE FAT DOCTOR IN THE WORLD? I may not be able to prescribe these meds for myself, but I certainly have 50 buddies on speed dial that could. Think about it! -Let’s take it a step farther, would there be any fat people in the world at all, especially those with money? Ever seen a fat rich person? Sure! There are plenty around. Would there be ONE FAT RICH PERSON in the world if it was as easy as finding the right pill? If you make a statement about your plan to lose weight, and the word “diet” is somewhere in the sentence, just give up because you are going to fail. By definition a diet is something you are either “on” or “off”. You will likely lose weight while on it, and gain it back when you get off it. So essentially all “diets” will result in a yo-yo affect to your weight. One other thing, the FDA has approved these medicines as “an addition to a reduced-calorie diet and exercise program.” They are not designed to simply remove the weight without requiring any effort from the patient. What does that mean? If you simply take the pills and do not change any of your already bad habits…you will fail again in improving your health longterm through significant weight loss. Obesity is a very complex problem and it’s rise in America is multi-factorial: lack of exercise, reliance on cheap food built on the backbone of highly processed carbohydrates, poverty, lack of nutritional education, reliance on “quick-fixes” as a society, government subsidies on corn and soy, the gradual extinction of cooking at home combined with increasing numbers of families chronically obtaining dinner through the car window, lack of sleep, an abundance of stress (and cortisol) in our lives!, manipulation of the food supply to promote weight gain, etc. I could go on and on. So, REALLY, does ANYONE think a little pill can even put a dent in any of this? 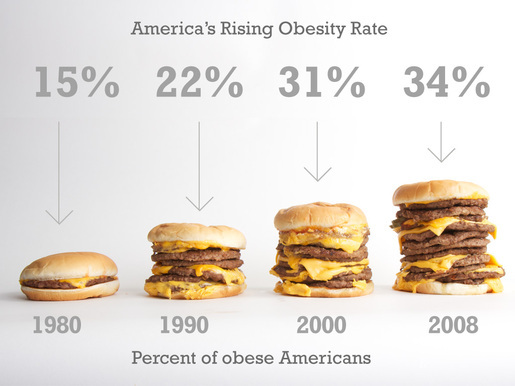 How do we fix obesity? Well, it’s not easy, but we must get at the root cause if we are to get anywhere. My motto is Real Food…Real Health. In the end, the beginning of the end of obesity must itself begin with a transition back to eating Real Food as a society. I’ve seen it around the web and twitter as JERF (Just Eat Real Food). This must start on an individual level, with individual families deciding that enough junk is enough. My family has made that choice, so can yours! Know anyone thinking about asking their doctor for one of these new pills? Invite them to read this post, and then ask them to join you on a journey to Real Health by emphasizing Real Food in their life again. Need more information? Browse around my blog for ways to change your life. Are you a reader, check out It Starts with Food by my friends Dallas and Melissa Hartwig. Don’t know where to start? Easy…JERF! Great blog. I appreciate your perspective on real foods. Qsymia contains topirimate which is the generic for Topamax. Doctors around here call it Dopamax. When I was prescribed a low dosage of it for migraines, I quickly learned why – I couldn’t speak a complete sentence without having a problem recalling one or more words. Giving up junk food would be far less frustrating. Agreed. It all starts with real food and understanding food. People forget that’s where it all starts. We are certainly a quick fix nation that sometimes looks for fixes rather than fixing the actual source of the problem. I love your strong stand and fact filled reasons for your stand on the diet pills! I find it interesting how many medical doctors are quick to write a prescription for them; but if you mention Paleo, they will snicker to themselves that the choice is just another fad diet. Your patients are lucky to have such a caring doctor who sincerely is concerned about them and their health. Stay Strong!